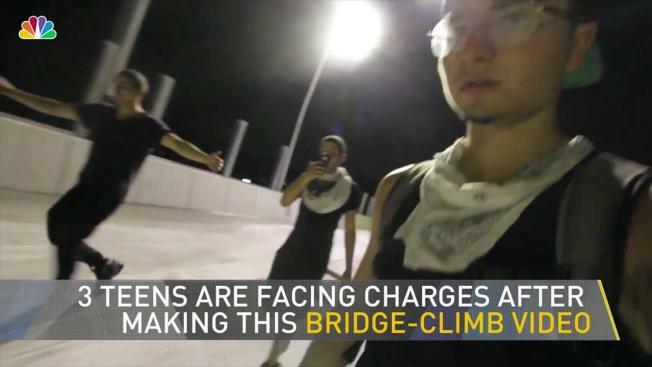 Three young men made a YouTube exploit of climbing the new Tappan Zee Bridge -- and now face criminal charges for their trouble. New York State Police said Monday three teens will face charges of third-degree criminal trespass, a misdemeanor, after their July early morning adventure surfaced online. The dark, nine-minute video shows the men casually pass through brush, walk along a train track and then climb a ladder to access the $4 billion bridge, part of which is scheduled to open this month after four years of construction. At one point they see a security guard and take off running. "Go fast, go fast, we have to go fast!" one of them shouts as they run to evade detection. The state police said they were notified of the video about 10 days ago. The teens were issued appearance tickets.